Over the past couple of weeks, I’ve had an interesting conversation with Spencer Yao of smallbusiness-domain.com, a provider of domain name, web hosting, and e-commerce reviews, rankings, comparisons, & coupons. Spencer was telling me about a recent domain sale his company was involved in. He walked me through the life cycle from the initial purchase to the sale. 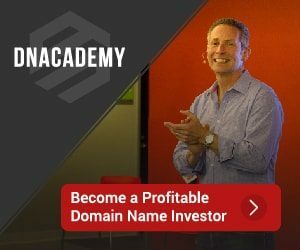 Spencer’s scenario provides some good food for thought when buying domain names with the intent to sell and I asked him to summarize his experience to share with you. Back in mid 2009, we were approached by a seller looking to quickly dispose of some premium domain names in the beauty and apparel vertical. The acquisition was opportunistic and serendipitous and we did not have much time to decide because the seller wanted to move fast. Although we had no direct experience in this beauty/apparel category (our group had substantial technical and monetization experience), we purchased one of the better domains because we thought it was truly “premium”, had decent type-in traffic, mapped to a common search term with clear commercial intent, and at an adequate discount to mitigate the risk. Unfortunately, we cannot disclose the name, but that does not change the content of this article. Below is a summary of our strategies to maximize value and eventual exit for the domain. Strategy 1 Build an ecommerce site similar to Diapers.com or Hammocks.com Highest potential reward and risk. Requires most technical & financial resources. We had no direct industry experience in this vertical. Industry was too low margin and fragmented to support such a business. Strategy 2 Turnkey site based on shopping engine listings. Hope premium domain name helps in SEO results. Much less work and maintenance than Scenario 1. Use API to auto generate sub categories and pages. Development costs to properly access & publish API. Little to no original content. Hard to monetize. Parked domain generated more revenue even though site had hundreds of pages. Strategy 3 Park, hold, and sell the domain. Little to no work involved Not adding any value to the domain. Hope we paid a low enough price to hold and wait for a buyer Last resort. Chose this scenario after exploring #1 and building #2. We determined Strategy 1 was not feasible after 4-6 weeks of post purchase research – this sub-category within Beauty/Apparel was too low margin to support an ecommerce business like Diapers.com or Hammocks.com It took us 4-6 months to build out and vet Strategy 2 – we determined that parking the domain generated more revenue with lower costs than the turnkey site. Domain Listing Services like Sedo and BuyDomains. We found these services provided little to no value even though they charged a substantial commission for listing a domain in their database. Domain Brokers. We retained several brokers who actively marketed the domain and emailed buyers on our behalf. Through several cycles, we received a handful of offers for about 50% to 80% of our target price which did not include the 10%-15% commission the broker earned if the sale was completed. The offers were from domain speculators who wanted to sit on the domain and flip it. This meant it would be hard for us to achieve “full value” through a broker. “For Sale” sign on the parked page. This is how we eventually sold the domain at our target price to a buyer who wanted to develop it into a website. The upside was that we received full price without having to pay a commission, but the downside was we held the domain for over 3 years before selling it. In summary, we purchased the domain (for mid to low 5 figures) and sold it for 30%-35% more than we paid, not including the work we put into Strategies 1 & 2. Comparing this to an investment benchmark such as the S&P 500 (which gained 39% over the same 3 year period), meant we were better off taking those funds and investing them in the market. However, since we were forced into Strategy 3, we were happy to make a slight “profit”. We could have waited for a buyer willing to pay more, but that could have taken years to achieve. If you are going to invest substantial dollars into a domain name, we learned the following valuable lessons: 1) Have a concrete development plan to turn the domain into a viable website. Direct industry experience is essential. 2) For maximum price, be prepared to sell the domain yourself and wait years for the right buyer. If you need liquidity in less than 6 months, use a domain broker and be willing to take 35 cents to 70 cents on the dollar.3) The market for premium domains seems to have peaked around 2007-2008 and has yet to recover to those levels. You have to consider this when looking at pre 2008 domain sales for comparison.